It was 6am in the first morning when we woke up in the cosy bedroom our host friends made us in an absolutely lovely spot north of Auckland overlooking the Pacific Ocean. They even prepared a child’s bed next to our double bed. It’s Nina’s first time sleeping in anything but a cot. We were pleasantly surprised that she fell asleep without any issue – a big relief knowing in the next 9 months we would have to encounter all kinds of bed configuration as they come. The last time I checked on her at 1am, she was sound asleep like a, well, baby, although in a somewhat awkward position – legs into our bed, head in the middle of her bed. Well I didn’t expect anything else but this. Whole night was uneventful, to my delight. But she was nowhere to be found at 6am!!!! At that brief moment I thought she just woke up and walked out of the room. But the door was shut and she couldn’t reach the door handle yet. There wasn’t a lot of room left in the bedroom with our stuff lying around everywhere. Around her bed we deliberately put our suitcase so to avoid her falling but she wasn’t on any of these things. We even looked inside the suitcase – could she fall into the suitcase and manage to zip it up? No she didn’t. 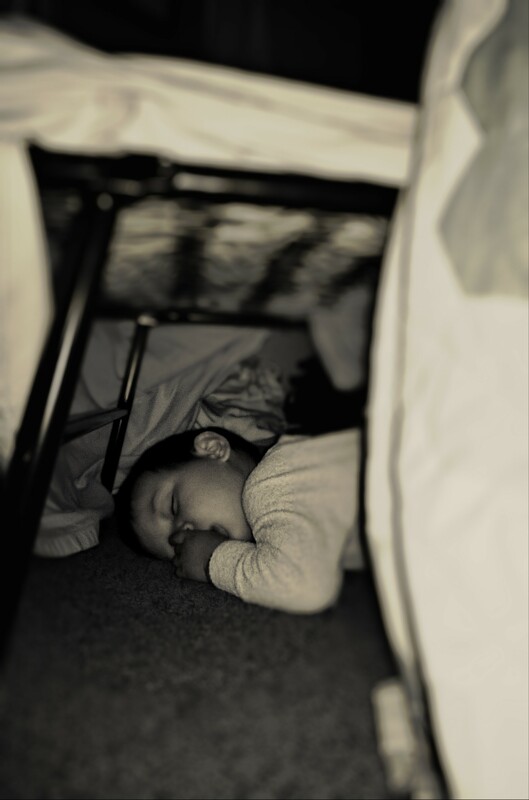 Then we pushed aside the dangling bed sheet and looked under the bed. There she was!!! Suddenly I was in panic, hearing myself asking Nicolas ‘elle est toujours vivante ?? (is she still alive?)’? I tried to sound calm. Did we manage to kill our daughter on the first night of our test trip, already? Then I heard her breathing. Ahhhhh the nicest sound on the planet at that moment. But how on earth did she manage to get herself under the bed and make herself comfortable there? There was just about 20cm of a gap where she could possibly get through because all other sides were blocked by either our bed, the wall, our suitcase, or other stuff. She had to fall off the bed at the exact spot next to the 20cm opening, wiggle herself into that opening through the thick daggling bed sheet, pull the bed sheet back to its place, and continue her sleep. She managed all these without waking her parents up who slept just next to her. Marvellous manoeuvre skills if you ask me. After confirming she was still breathing, I couldn’t stop laughing at the sight of her, totally in peace with the newly found spot to spend the night. I decided tonight she is going to sleep on the mattress directly on the floor. I almost look forward to finding out how else she could possibly surprise her parents, again. Previous Article: So Where Are You Going?